A man has been arrested after a motorcyclist died in a crash. 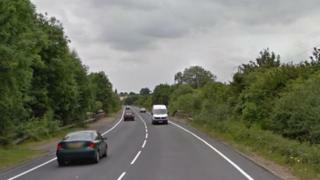 The rider of an orange Honda CBR 1000 motorbike, aged in his 50s, died at the scene on the A414 in Langford, Essex. A 23-year-old man, from West Mersea who was driving a Seat Ibiza, has been arrested on suspicion of causing death by careless driving. Essex Police is keen to speak to anyone who may have footage of the bike or the car before the crash, which happened at 15:30 GMT.